Ever a reminder what NOT to be. I love the Beatles, but I love their later stuff more when they were way to famous for a record label to force them to be bubble-gummy. Plus their production values went up and they had more complex instrumentation. Much like their critics, I really start paying attention at Elenor Rigby. 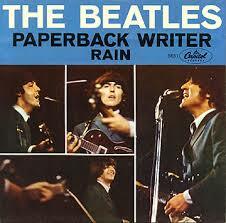 But I love Paperback Writer. It is forever, for me, a reminder of the pitfalls that surround writing, and that many of the themes of writers wanting to break into the industry were already tired and worn out cliches worth poking a bit of fun at....even forty-five years ago. I also think the "controversy" of Lear is easily solved if you consider how many pretentious writers claim to be reproducing a style when they so obviously know nothing about it. ("This is chick lit crossed with superhero fiction crossed with gritty western all set in steampunk....but literary") You can't get much further apart than a nonsense poet and popular commercial novels. Not without adding complex lit analysis into your pop song. It is ever a reminder to me to keep working, keep working hard, and keep working to improve the quality of my writing (not just to write more words). I just realized that your head is cut out and glued to that picture. I RESENT THAT....it's photoshopped--not cut and glued. Er...I mean...um...it's totally real! What are you talking about? Either way, this changes everything. You probably don't even OWN a smoking jacket. My fantasy has been destroyed. Good day dear sir! There is a reason why I listen to this song on the 1st of November before I set down my opening words for NaNoWriMo. I hope we're still friends after my NaNo post. :-D You are TOTALLY one of the ones I know can handle it (and also the one I spar with using foils and epees). I've never had a Nemesis before!! !